The recently concluded Allied Social Sciences Association annual meeting (better known as the American Economic Association and affiliated groups) showed a re-emergence of conventional thinking as the "mainstream" tries to rehabilitate their positions on debt, economic growth and austerity. The conference had a bit of a rocky start thanks to the snow storm that hit Philadelphia and the rest of the Northeast so there were incomplete panels and speakers who were not able to be in attendance. My concern in sitting through six panels on Friday and Saturday is that there is still a large number of economists, prominent members of the mainstream, that are hell bent on twisting economic policy toward the same thinking that got us into the crisis in the first place. Over the last few years the volume has increased at these gatherings. The introspection seen in 2010 is largely gone. The creative thinking comes from the "allied" groups like Labor and Employment, Evolutionary Economics and URPE. For example, there were several different panels, three by my count, which featured either Rogoff or Reinhart from Harvard talking about their twin theories of the difficulty of recovering from financial crisis and the relationship of levels of public debt and economic growth. While economists like Pollin from UMass and Krugman from Princeton have debunked much of what they write, the AEA gave them plentiful platforms for discussion of their work. These panels frequently involved a discussion of austerity; the process by which advanced economies have been shrinking their public sectors during this period of economic stagnation (or decline if you are in Europe). The great irony in all this … the mainstream economist who made the most sense in these discussions was Larry Summers. He has a theory of contemporary secular stagnation which discusses the current stagnation and whether it is fixable given normal mechanisms … he thinks no. Of course, significant progressives like Paul Krugman and Brad DeLong did not participate this year. There were interesting talks from others at the Evolutionary Economics, URPE and Economists for Peace panels. If you are interested in seeing significant work from progressive economists skip the AEA proceedings and go right to Dean Baker, Larry Mishel and Stephanie Kelton. Oh and hope it doesn't snow in Boston in the first couple days of New Year 2015; because that is where the conference meets next year. I'm a bit worried it is going to be me and some folks from Harvard and MIT if the weather is as bad as this year. The great Heidi Moore of The Guardian writes about the sad juxtaposition of the fortunes being made in the Twitter IPO and the first round of cuts in SNAP benefits (food stamps). Bonnie Kavoussi has a new blog where her first post is about the growing emotional and physical tie of workers to their jobs because of lessened security in the tepid recovery. Larry Mishel of the Economic Policy Institute (who I had the pleasure of siting next to at a recent Dissent Magazine celebration) writes a series of pieces about how the problem of slow job growth is not due to automation (or the hollowing of the workforce) but rather weak policy responses to the bursting of bubbles and the stagnant economy for the overwhelming majority of Americans. 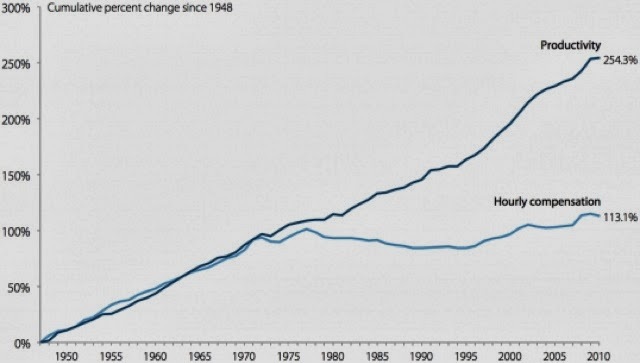 which shows the change in productivity (high) and median wages (low) from the mid-1970's until today. The fundamental question is why? (Thanks to EPI for the graphic) The reasonable explanations include loss of worker power due to uncertain labor market conditions and decline of union protections, the internationalization of labor markets due to off-shoring, capital inflows into the US from bad trade policies where we import finished goods and capital which provides an incentive to automate production, increased reliance on financialization of industry and increasing dependence on service companies for employment. As a former executive from the software and automation industry I have always been interested in the hollowing out hypothesis that Mishel refutes. To some extent it is intuitive that automation would be applied to higher paid, lower skilled jobs (like material handling or administration). Anecdotally I have seen that in projects that I participated in during my years in business. However, the most successful projects didn't eliminate positions in real time but rather increased productivity so that as the businesses grew they would need to apply less labor effort to the enterprise. Yet as I go through the checklist of places I helped from the mid 1980's until 2010 I recognize that many of the projects involved either manufacturing or distribution/warehousing firms that eventually off-shored. Of course I saw my share of service industries that are still in business and placed a premium on more accurate information which improved customer service but lessened labor content of service delivery. 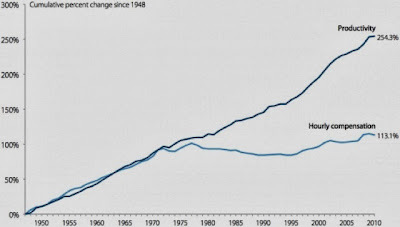 In the end there are lots of reasons why but we arrive in the same place, the benefit of economic progress (productivity) flow to those with the power. These are the threads of the debate about inequality and what to do about it. You can't deny that that we are staring at a chasm of economic inequality greater than at any time since the Great Depression. In recent months this has drawn critical appraisal from Pope Francis, President Obama and a vast array of government officials as well as commentators on the social, economic and political environments. 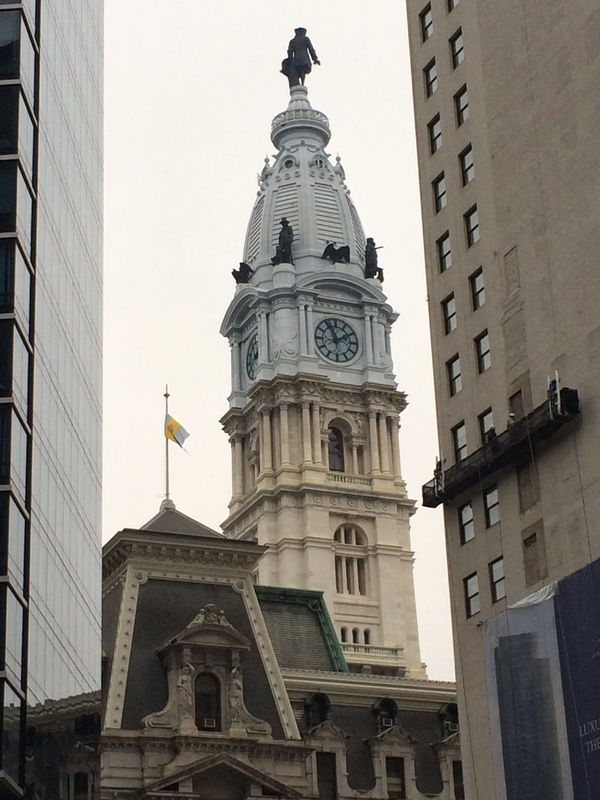 This weekend marks the beginning of the ASSA and AEA 2014 in Philadelphia which should be an interesting intellectual battleground between those looking to do something to help heal the festering sore of inequality and those looking to stoke the fires of austerity which promise to make things worse.